Minerva Teichert - Rescue of the Lost Lamb painting was done in 1939 by the artist. Minerva was a student of art in New York City. She worked with other artists like Edward Hopper who encouraged her to paint “her church history and story using Mormon Art”. 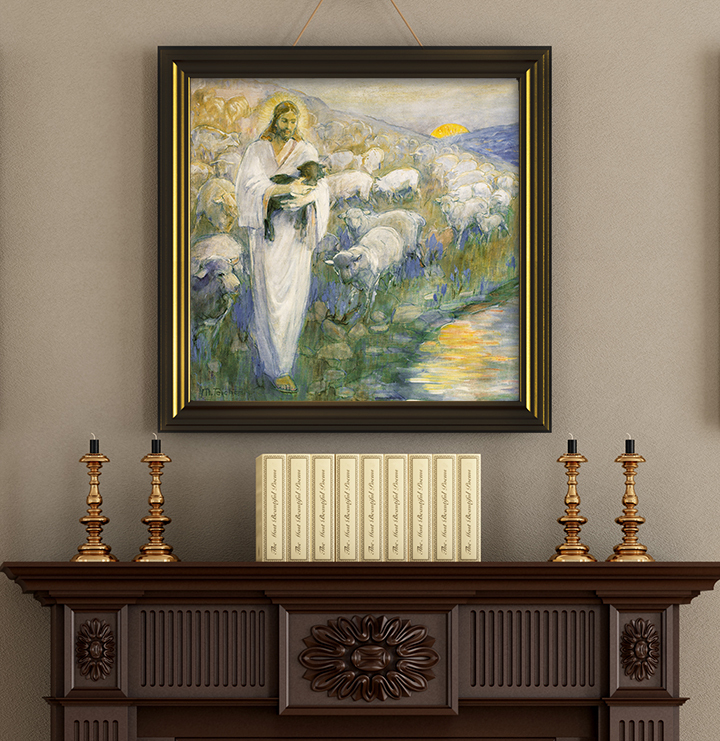 Rescue of the Lost Lamb is among the most beloved of Minerva Teichert art. It depicts the biblical parable of the lost lamb. "What man of you, having an hundred sheep, if he lose one of them, doth not leave the ninety and nine in the wilderness, and go after that which is lost, until he find it? And when he hath found it, he layeth it on his shoulders, rejoicing. And when he cometh home, he calleth together his friends and neighbours, saying unto them, Rejoice with me; for I have found my sheep which was lost." (Luke 15:4-6). This piece is printed on high quality Museum Giclee Canvas.